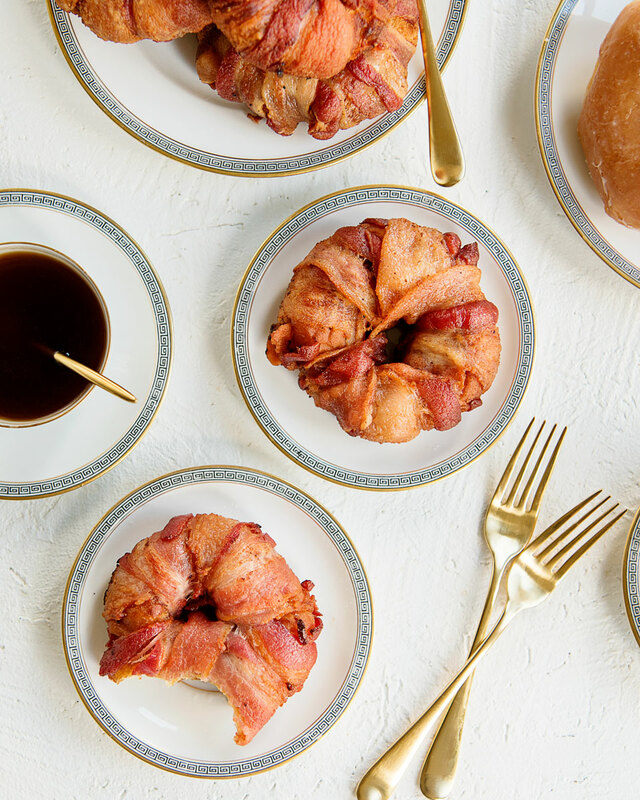 Take breakfast to the next level with a recipe for bacon wrapped donuts – and donut holes! They are surprisingly easy to make and obviously taste amazing. Growing up in Wisconsin, state fair food was everything. The state fair was pretty much my favorite week of the year. I loved all the ridiculous fried treats (Twinkies anyone? ), cream puffs and cheese curds. It was like a food paradise. It was probably my first experience as a passionate foodie instead of someone who just liked food. 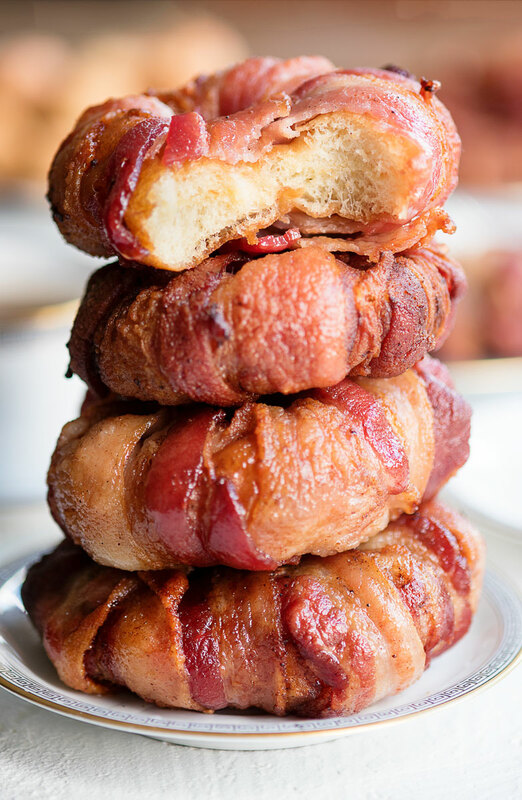 These bacon wrapped donuts are my ode to the state fair. They are everything you love about fair food but quick and easy to make at home and definitely better tasting. It just takes a few minutes to whip up a batch making them great for when you’re hosting brunch. 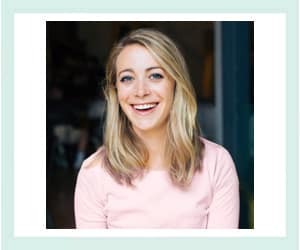 Get the full recipe after the jump! I would love to tell you that they are outrageous and attention-grabbing but that they don’t taste that great. I would love that – for you, for me, and for my waistline. 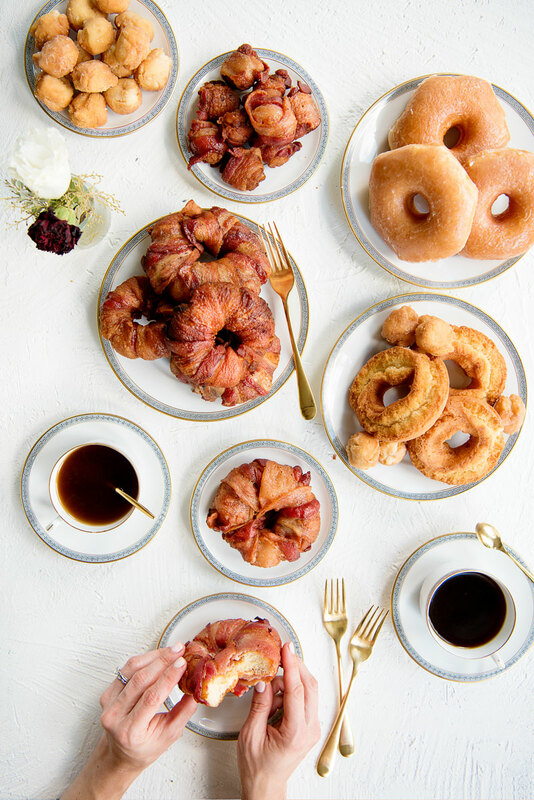 Unfortunately, though, the combination of donuts and bacon is also delicious. 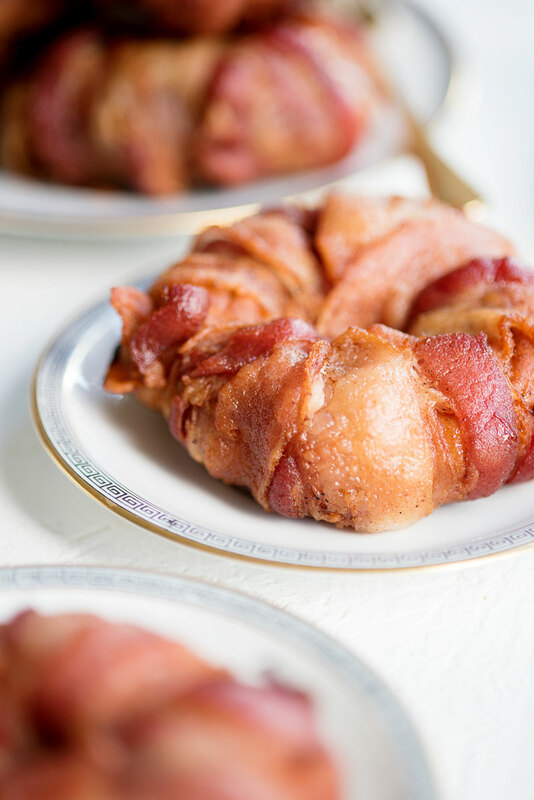 They’re probably worth making at least once in your life just so you can tell your coworkers and friends that you made – and ate – homemade bacon wrapped donuts. And you should do it soon unless your New Year’s Resolution is to eat more bacon! 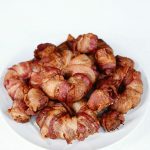 Wrap uncooked bacon strips around doughnut in an overlapping fashion, securing ends with toothpicks. 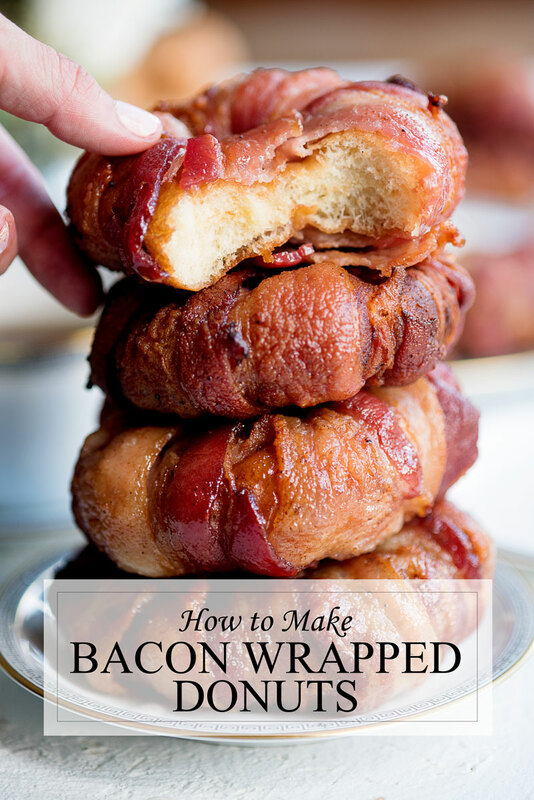 Don’t worry if the donut breaks when you’re doing this, just wrap bacon over both ends and secure it together with a toothpick. I used 3-4 strips of bacon per doughnut. 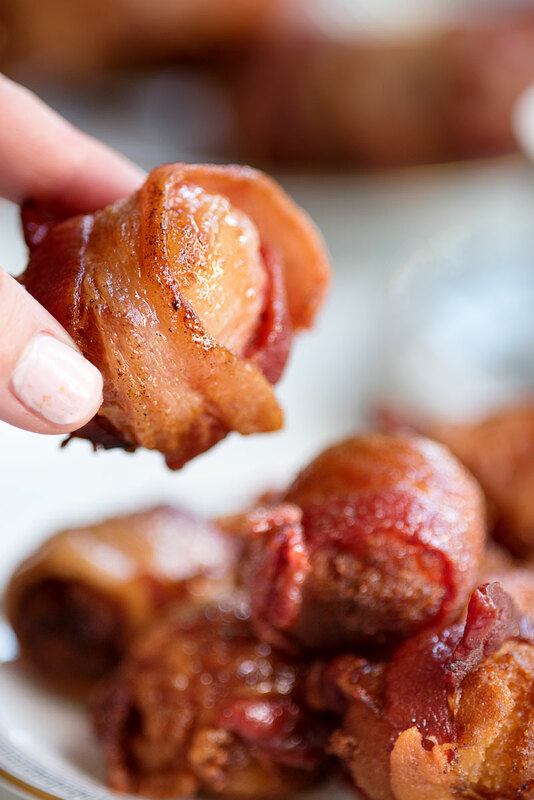 Donut holes take about 1/3 of a piece of bacon. Heat canola oil in a large pot to 350 degrees Fahrenheit. 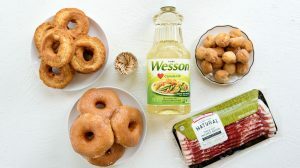 Cook 2 donuts at a time by using a slotted spoon or spatula to gently lower lower them into the hot oil. Cook for about 2 minutes per side until bacon is golden and crispy. Remove from oil and place on a plate lined with several paper towels. Remove toothpicks and enjoy immediately. Regular or cake donuts will work for this recipe. Holy smokes these look sooooooo amazing!!!!!! I promise THEY ARE!!!! You have to make them! These sound heavenly even though my waistline would hate it. Like you said though, you’ve gotta try it at least once. The holidays are the ideal time to indulge. Exactly! You definitely won’t regret it!